High quality and lightweight material|The height of the crossbar can be adjusted by the holes on the conical barrel|Build and reinforce a strong relationship between you and your pets|Train pet's sense of balance; Teach pet to follow the orders correctly|Cross Bar Length: Dia.2.2 x 100L (cm); Conical Barrel Dimension: Dia.23 x 30H (cm). I am using these cones and poles for my flattie after her crutiate op, it is very useful to have different heights, so I can adjust the heights as she improves, she walks over them slowly at this stage to use her muscles gradually. My other flattie loves them too she practices walking backwards and forward focus when doing send aways! 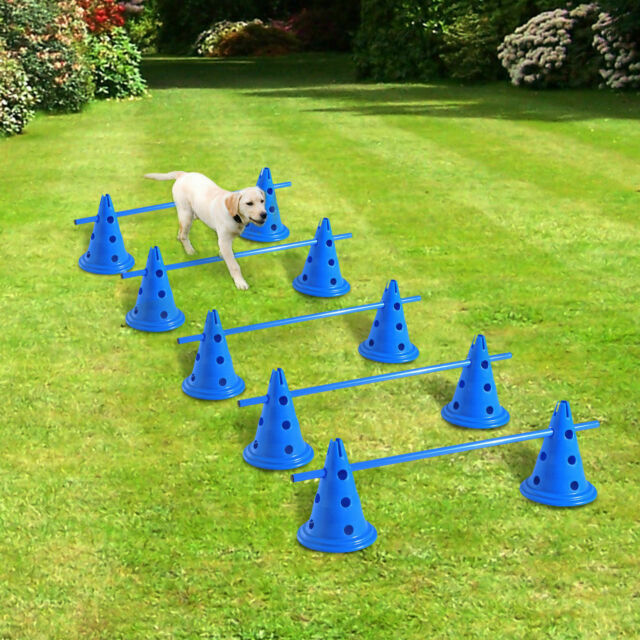 Great set of agility equipment. Comes in a lovely bag to keep it altogether after you’ve finished using it. Great fun and easy to use.